Remember this yummy cornbread that my friends and I enjoyed during our cooking trip in Napa? Well, I made it at home not long ago to enjoy alongside some White Bean Chile Verde…it turned out delicious. I made it using my cast iron skillet, this was a first for me. I loved how crisp the edges turned out, and I loved having them cut into moist wedges. I served the cornbread with some hot pepper jelly I had in the pantry and it was a delicious combination! 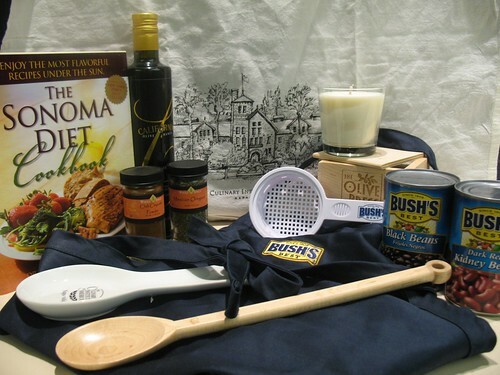 To be eligible to win this great gift basket all you have to do is share your favorite chili recipe! It could be yours, your mother’s or come from your favorite magazine, cookbook or website. To enter the contest, leave a comment including the link to the recipe or type out the recipe to share (with it’s source please). If it’s your recipe and you have a blog, please leave a comment with a link to your post (it can be an already posted recipe). As a bonus, I will be posting a round up of blogger chili recipes (with links) to share with all my readers so please email me a photo and link to your recipe post at aggiedgoodman (at) gmail.com if you want to be included in the roundup. After you enter your chili recipe into the contest, you have two chances for additional entries! 1. Become a fan of Aggie’s Kitchen on Facebook. If you are already a fan, share my page with your foodie friends! Come back and leave a comment saying you did and that comment will be your additional entry. 2. Spread the word! Post about this contest on your blog, Facebook or Twitter and come back and leave a comment saying you did for an additional entry. Contest ends Saturday, April 3 at midnight, EST. Winner will be chosen randomly and announced shortly after. 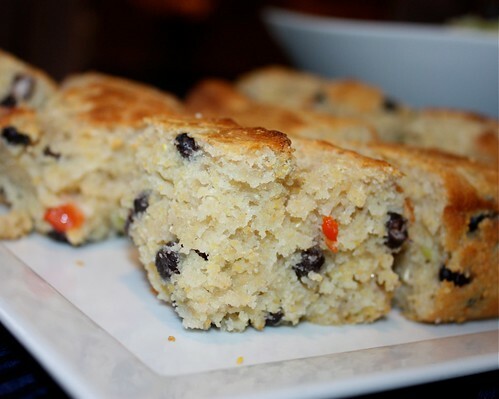 Oh and before I forget…here’s that cornbread recipe! 1 Preheat oven to 350. Lightly grease a 9 inch cast iron pan or oven proof individual serving crocks and heat in the oven until very hot about 20 minutes. Mix together flour, sugar, cornmeal, baking powder and salt. 2 In a separate bowl, whisk together eggs, buttermilk, oil and melted butter until blended add black beans. Add the wet ingredients to the dry ingredients, and combine until well mixed. 3 Remove the pan from the oven and pour batter into prepared pan and bake approximately 30 minutes until the surface is golden brown and a tooth pick inserted in the center comes out clean. Remove from the oven and serve in wedges with spicy red pepper jam and butter. man! now that is some cornbread! i must try this one Agg! Aggie, first of all, our cornbread looks delicious! Second of all, I love, love, love the Bush Beans with Chili Sauce and it is the one I usually buy when making chili – and still make my chili the regular way. Gives it a lot more chili flavor (which I love!). I love me so good corn bread!!! Here is my blog post on Turkey Taco Chili! Aggie, I so enjoy your blog! The cornbread looks delicious! Thanks for the contest! I’ll definitely be stopping by again! that looks incredible! 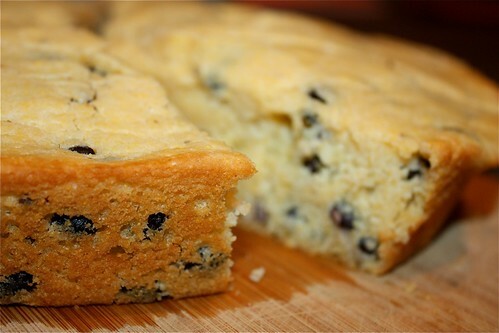 I love the idea of adding black beans into cornbread. The only way I make cornbread is in my cast iron skillet. I love making different types of cormbread and I can’t wait to try this one. I also love all different types of chili recipes and I’m looking forward to the roundup so I can get more recipes. I really like this one on my blog from Picky Palate…..a chicken and 3 bean chili recipe that is so good. Well, I know I can’t win. BUT … it looks delish. I WAS delish! 🙂 Have fun with the giveaway, Aggie! That cornbread looks SO good! 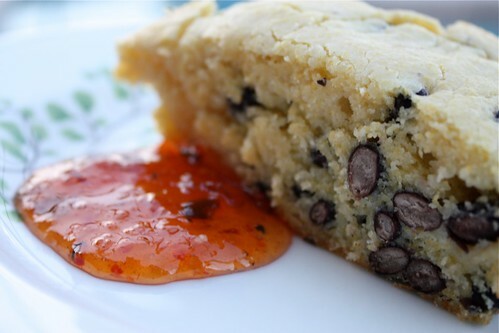 I’ve never made corn bread but love the idea of adding beans to it! I love using ground turkey for my chili. I use this recipe but also modify it based on what I have. ground turkey in lg pot, add the rest of the ingredients (do not drain the beans), add seasoning to taste, simmer until heated through. I’m already a fan and I had shared your FB page and blog with my friends a LOOONG time ago! But I did post it again and share with some newbies! Hi, Aggie! The recipe that I’m submitting isn’t my own but, my Dutch husband, Richard. He doesn’t make his own chili but rather, he uses an exceptional canned variety that he incorporates into a dish we love to eat! It all sounds delightful Aggie. Here is my favourite chili recipe. Perhaps I just enjoy serving it in a bread bowl. Here is a link to my favorite. I’m more of a while chicken chili person. I’m not even a big cornbread person but that looks crazy good. Love the idea of having black beans in it! Here is my families favorite Chili recipe. Simple, but yummy. It is my own creation. Brown the Ground Turkey and season to taste with (Chile Powder, Seasoned Salt, Garlic Powder and Black Pepper are what I use). In a large stockpot, combine the browned turkey and cans of Rotel, let simmer for a few minutes over medium-high heat. Add all cans of beans and bring to a boil, then reduce heat and simmer until ready to serve. Right before serving, add the can of Niblets and Diced tomatoes as well as table salt to taste. Mix thoroughly and serve with warmed tortillas, homemade rolls or cornbread. I love the texture of this chili, it’s really smooth and you can’t taste the pumpkin! Here is my favorite recipe. Take a lot to prepare but turned out awesome! I love cooking corn bread in a cast iron pan. Your recipe looks fantastic – I need to try it! Fabulous cornbread and such a great giveaway! Here’s my all-time favorite chili recipe. It’s made with ground turkey and pumpkin puree (among other things of course!) The pumpkin packs in great nutrition and gives such a nice texture. The other slightly oddball ingredient is cinnamon. Sounds a little different, but this is the chili we crave most! That’s some tasty looking cornbread!!! I love black beans! Ok, here’s my favorite chili. It’s sort of my uncle’s and sort of mine (my uncle is our family’s chili connoisseur!). 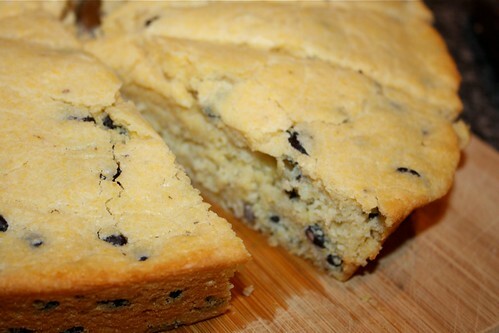 A yummy twist on cornbread – I’ll have to try that sometime!